Christopher has a particular interest in commercial disputes and chancery law. Appearing regularly in both the High Court and the County his reputation as a rising star is well established. Highly valued by Solicitors and their commercial clients as a safe pair of hands, Christopher’s common sense approach and commercial acumen resonate well with business clients who trust him with their disputes. Christopher has experience in both corporate and personal insolvency, covering every stage of the insolvency process; including contested petitions and administration applications. Again his reputation for common sense and commerciality impresses clients. Christopher represents landlords and tenants in litigation arising out of leases, licences and tenancy agreements. With a particular interest in commercial property including enfranchisement, service charge disputes, dilapidations and business tenancy renewals Christopher also has experience in dealing with social housing issues, possession claims, anti-social behaviour allegations and applications for injunctive relief. Christopher covers all aspects of real property litigation, including boundary disputes, easements, covenants, disputes concerning beneficial ownership, rectification, mortgages/ charges. Christopher is frequently instructed to advise and represent beneficiaries and personal representatives in contentious probate matters and claims under the Inheritance (Provision for Family and Dependants) Act 1975. Christopher prosecutes and defends in the Youth Court, Magistrates’ Court and Crown Court. His expertise covers a spectrum of criminal offences including fraud, violent crime and sexual offences. Christopher also acts on behalf of local authorities, Her Majesty’s Revenue and Customs (HMRC), the Security Industry Authority (SIA), Trading Standards (TS) and the Royal Society for the Prevention of Cruelty to Animals (RSPCA). He has appeared successfully in the Court of Appeal. 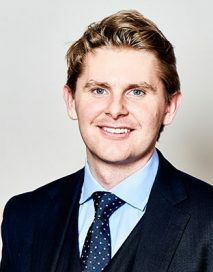 Christopher appears regularly in the Family Proceedings Court (FPC) and County Court in both public and private law matters. He also represents applicants and respondents at all stages of financial remedy proceedings. Before coming to the Bar, Christopher assisted various pro bono initiatives (Law Centre NI, Committee on the Administration of Justice (CAJ), NSPCC Young Witness Service and Victim Support NI). Working with The PILS (Public Interest Litigation Support) Project he authored a policy paper entitled “Pro Bono Costs Orders in Northern Ireland: A Vision for the Future” a document currently being considered by the Stormont Assembly.